People are wired to be social creatures. Twitter, Instagram, and Facebook have capitalized on this human need to enormous success. Facebook alone has almost two billion monthly active users as of May 2017. However, there’s a dark side to the popularity of social media. Scammers and cybercriminals go where there’s money to be made. The Philippine National Police Anti-Cybercrime Group (PNP ACG) recently revealed that online scams are still the most prevalent, with 555 cases reported in 2016 until the first quarter of 2017. Know who you are dealing with. If one of your contacts asks for your personal information or money through social media, immediately call him or her through other touch points (e.g. landline or mobile number) to validate their request. Regularly review your privacy and security settings. Take simple steps to secure your social media accounts. Profiles that are publicly displayed are the most vulnerable to scammers. Look for the Privacy and/or Security options in your social media account and set them up properly. Installing credible anti-malware software also helps to protect your computer or mobile phone’s overall security. Avoid putting sensitive details on your profile. Remove your home address, phone number, date of birth and any other information that could be used to steal your identity. Con artists obtain key pieces of your personal information from your social media account profile, which they use to recover your account passwords (via the password recovery facility) or apply a bank loan in your name. Use multi-factor authentication. Multi-factor authentication means it takes more than just your password to access your account or reset your password. An example of this is enabling the One-Time PIN (OTP) that social media sites offer as an added security option. Whenever you login or request a reset of your password, an OTP is sent to the mobile number you registered with the site. Dodge clickjacking. Did you just read a news header that your favorite singer died? (Click!) Or that you can earn thousands in a day without leaving your house? (Click!) Clickbaits rely on sensationalism or eye-catching thumbnail pictures to tempt you to click on the links or share them. But beware: the links may install malware in your computer that steal personal information or bank log-in credentials. Be wary of these links and verify news through legitimate media sources. Be Vigilant. If you think that your bank account has been compromised, call your bank’s customer service hotline to report and verify any suspicious activities in your account. At PSBank, you can conveniently and closely monitor any movements in your account through the PSBank Mobile App and PSBank Online. “Social media is the most powerful communication tool in the world, but it is also the most dangerous. 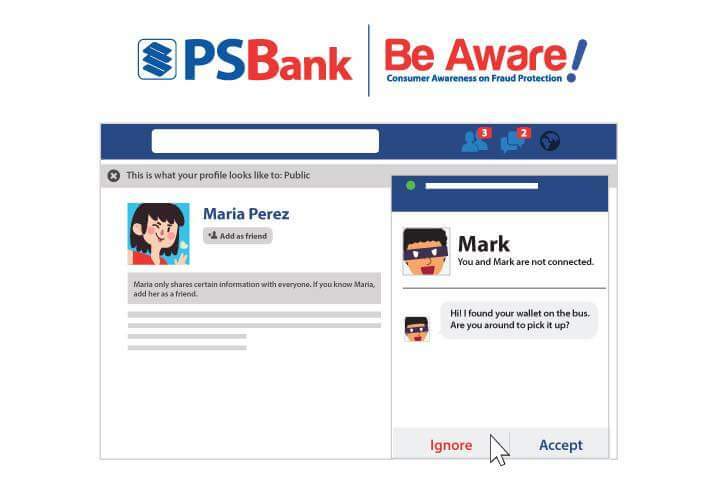 Learning how to secure your accounts and avoid obvious threats goes a long way in protecting your name and money online,” said PSBank Vice President for Information Security Dan Jose D. Duplito.